Limited liability companies have similar aspects to most businesses but they have been set up in a way that the member’s personal finances are protected. Personal responsibility for any debts incurred by the business is reduced or eliminated. As such there are certain rules and requirements that make up limited liability company agreements and contracts. In general there are three different versions of a limited liability company. These are public limited companies that must have at least two shareholders, with shares offered to the public. Private unlimited companies, which are usually created for certain purposes, and the more common private limited companies that can have one or more shareholders but cannot sell or offer shares to the public. The formation of a limited liability company is often performed by solicitors or company registration associates. However the shareholders who wish to form a limited company can apply directly to the Registrar of Companies and advice can be given from Companies House. The actual name of the company. Where the company will be located. The amount of capital that exists. A stipulation that the member’s liability is limited. That members will contribute to the company assets if the business fails or is terminated. Whether or not the company will be a public company. The Articles of Association is the second limited liability company document that must be submitted to the Registrar of Companies. In this document information will be submitted on the rights of the shareholders, general meeting details, information on the payment of dividends, and the authorities granted to directors. There is also a section on whether or not shareholder can transfer any of the shares, and rules and regulations regarding the issue of any new shares. As well as the Articles of Association and the Memorandum of Association there will be other documents that must be filled in and approved by the Registrar of Companies. These documents may include an Incorporation document if a limited liability partnership is to be formed. All of the documents that are sent to the Registrar of Companies will be thoroughly checked. Checks on the prospective company members will be made with the register of disqualified members and directors. Any discrepancies found may lead to a refusal of the formation of the limited liability company. Under company law all limited liability companies are required to file certain documents to the Registrar of Companies. These will include annual returns and annual accounts and these documents will be made available by the registrar for inspection by the public. Accounts must include profit and loss details, a company balance document, and an auditor and director’s report. The information included on annual returns will be the company’s registered office address and the names and addresses of the directors. All of the above documentation is legally required for the formation and running of a limited liability company. There may be other limited liability company agreements set out between members that designate the roles each member will play within the business. 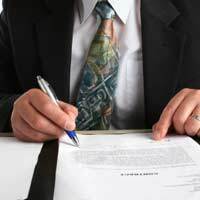 These agreements and contracts will state the actual terms and conditions of the business in case any disputes arise regarding the day to day running of the business. As with any business contract, legal expertise should be used when drafting and submitting any limited liability company agreements and contracts. A Legally Binding Contract That You Didn't Mean to Enter? Can He Get His Flat Deposit Refunded? Can I Reject an Out of Court Settlement after Accepting it? Can we Just Guarantee Our Daughters Rent? Cancelled Insurance, Payments Still Taken: Where Do I Stand? Do I Have Any Rights to Stay in my Rented Shop? Does 'Cooling Off' Period Apply to Contract Made By Phone? How can I get out of my Contract Hire Car Agreement? How do I get out of my Shared Lease? How do I get the Money I'm Owed? Is There Any Way I Can Get The Title Deeds Back? Landlord Has Tampered With the Meter: What Can I Do? Name on Title Deeds: What Happens If I Move Out? Should I Have a Contract of Employment by Now? Timeshare - Can I Cancel My Contract? Do You Have to Know About a Breach to Be Liable? What is a Constructive Trust? What Are Office Romance Contracts? What If I Don't Have a Written Contract With My Employer? Title Deeds: Who Keeps Them? What is a Mortgage Contract? When Can a Landlord Rightfully Evict Someone? Questionnaire: What To Do When a Contract is Breached? Re: What If I Don't Have a Written Contract With My Employer? ** Late ** in being paid. The QS was either sacked or quit and did not process our December Invoice for £25k. Re: Title Deeds: Who Keeps Them?